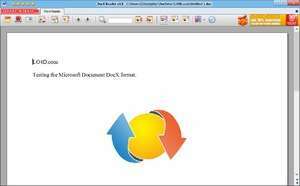 DocX Reader is a small and simple program which provides you the ability to view DocX files which were produced with a modern version of Microsoft Word. You can use it to print documents but not edit them. The interface of this application is pretty basic and opening and printing files is an easy task thanks to the icons presented. The functionality of DocX Reader is pretty spot on and parsing of MS Word documents seems to be correct as is printing the documents. Version 2.1.1 is a freeware program which does not have restrictions and it's free so it doesn't cost anything. For security reasons, you should also check out the DocX Reader download at LO4D.com which includes virus and malware tests. Additional screenshots of this application download may be available, too.